Johannesburg, November 20, 2018 – On 19 November, Unilever gathered stakeholders from government, private enterprise, NGO’s and media to commemorate World Toilet Day at a first of its kind sanitation event. The Flush Forum, hosted by Unilever’s toilet hygiene brand, Domestos. aimed to heed the President’s call for collective action to help solve the country’s school sanitation crisis. This event follows a breakfast in August where President Cyril Ramaphosa announced the SAFE (Sanitation Appropriate For Education) Initiative, which has since received support from various local and international corporations and organisations. Right now, 4.5 billion people in the world are living without proper sanitation and 892 million people are still practising open defecation. Established in 2012 by the UN, World Toilet Day encourages people across the globe to support actions that will ensure that all people have access to safe, hygienic toilet by 2030. With school sanitation being a top priority for the South African government, World Toilet Day was the ideal time to bring together stakeholders from all spheres of South African society for panel discussions, addresses and workshops to pool knowledge and resources to deliver holistic, and sustainable solutions and ultimately improve the lives of our schoolchildren. A panel of speakers representing the Department of Basic Education, Unilever and UNICEF reinforced the importance of partnerships towards achieving the SAFE initiative mandate. Guest speaker on the day was Anele Mdoda. A video shared on social media by Domestos on Tuesday last week showed her emotional reaction when she was confronted with the realities of the situation – something which she expanded on in her address to the Flush Forum guests. 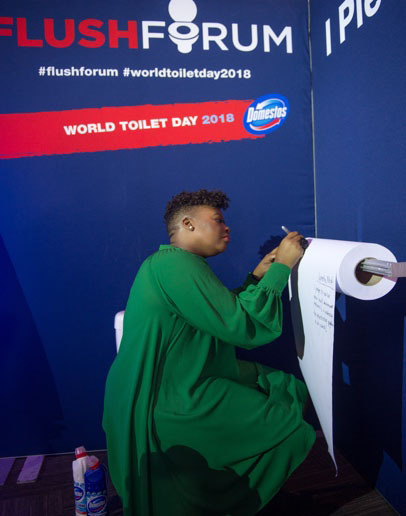 On Monday 19 November 2018, Anele, who was so moved by this initiative, called on South Africans from all walks of life to join her on this journey by supporting her own crowdfunding campaign to raise funds for the Domestos’ Cleaner Toilets Brighter Future campaign. She kicked off the campaign by donating R10 000 which was matched by Domestos. Within minutes of this announcement, there was an outpour of support received from businesses, consumers and organisations around the country who wanted to lend a hand to help restore dignity to South African children. The donations and support received was incredible and diverse; some chose to donate money (donations ranged from as little as R50 to as much as R20 000), some chose to sponsor product and resources (Tile Africa, Norcros committed to R550 000 infrastructure resources), while others offered their expertise and skills from relevant industries such as engineering and innovative sanitation technology solutions. Soon more delegates at the Flush Forum were moved to contribute including Unilever’s Luc-Olivier Marquet who, in his personal capacity donated R20 000 and Programme Director of the event, Lynette Ntuli, who pledged R5 000. By the end of the day, the total contributions in cash and kind were standing at over R700 000,00 and were well on the way to meeting the goal of R1.1 million. The campaign will continue for the next 60 days and donations can be made at Thundafund.com. In 2019, Domestos has committed to renovating and building new toilets in two schools but with the help of Anele’s crowdfunding campaign, they hope to increase that number to at least one more school. With such an impressive momentum received so far, Domestos and their partners are confident that together they will improve the sanitation situation in South African schools and reach their goals faster. 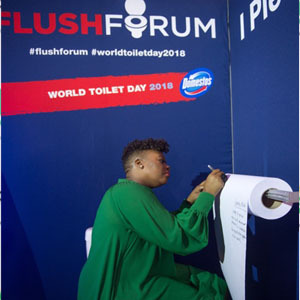 As discussions took place inside the Flush Forum, so conversations were ignited online with several notable South Africans, including former Public Protector, Prof. Thuli Madonsela and Carte Blanche presenter Claire Mawisa sharing some thought-provoking tweets. As part of Unilever’s Sustainable Living Plan, Domestos has a global ambition to help over 25 million people globally to gain improved access to a toilet by 2020 including 2 million people in South Africa. To date, Domestos has reached almost 1.5 million children with hygiene education between 2015 and 2017 through the Germbusters Club and National Schools Hygiene and Sanitation Programme in partnership with the Department of Education. Domestos’s Cleaner Toilets Brighter Future campaign has also seen the brand renovate and upgrade toilet facilities in 27 township schools to date and in 2018. In 2019, Domestos has committed to renovating or building new toilets in two schools but with the help of Anele’s crowdfunding campaign, they hope to increase that number to include at least one more school. This year, after realising that the situation required a more holistic approach, Domestos launched a Cleaner Toilets Brighter Future Programme School Janitor Programme, empowering janitors with training and uniforms, equipment and products so that they can assist in maintaining toilet facilities in 210 schools. At the event, Domestos awarded three schools with R10 000 each for their commitment to improving sanitation facilities and habits in their schools in accordance with the Domestos programmes. Domestos also recognised 28 general workers and 12 principals from the Cleaner Toilets Brighter Future Programme for outstanding efforts in their respective schools. This World Toilet Day, South Africa seems closer than ever to finding real, actionable solutions to end the school sanitation crisis. The Flush Forum was a reminder to all parties that, as the famous African proverb suggests, we can go further together. Full report will be supplied once donations have closed.